Joseph-Armand Bombardier, the son of a Canadian farmer, was convinced from his childhood that specific fields were needed for snow-covered fields and forests. And so, having acquired a small garage in 1926, he began to design his first snowmobile. Eleven years later, his first offspring — the B-7 snowmobile — was protected by a patent, and five years later put into production at a newly established company called L’Auto-Neige Bombardier. Five years later, the production of snowmobiles was 1000 units per year, and it continued to grow dramatically due to the success of the new B12 and C18 models. Obviously, by this moment the idea of a snowmobile had been transformed from a utilitarian vehicle to a sports one. In 1959, the Ski-Doo series was launched, once and for all determining the development of snow-adrenaline thought. In just 14 years, the number of Ski-Doo snowmobiles sold reached 1 million. The ideology and principles laid down by Joseph-Armand Bombardier turned out to be so ardently accepted all over the world that they demanded applications to other areas of transport. In 1968, four years after the death of the founder of the brand, the first hydrocycles of the Sea-Doo line, which opened the successful water chronicles of Bombardier, were released. From this point on, new models and new classes of water equipment constantly appear in its production. The same happened with hydrocycles: it took the world two decades to evaluate the idea, but over the next decade, half a million hydrocycles rolled off the Bombardier conveyor, covering two-thirds of the world's demand. Despite the subsequent wildly growing popularity of this type of transport, the proportion of production has remained to this day. In 1970, Bombardier acquired the Austrian company Lohnerwerke GmbH with its Rotax-Werk division, which manufactures Rotax engines, which are now equipped with jet skis and boats. Repeated innovations in the field of engine design, fuel injection systems, noise protection and other systems have deservedly created Bombardier-Rotax GmbH as a world leader. If the first Sea-Doo looked a bit like the same snowmobile, then in the early 90s, with the start of production of Sea-Doo XPTM, the form became closer to the modern outlines, and the strict environmental rules required a different approach to the engine. Today, Bombardier jet skis have become, according to the developers, 70% quieter and 90% cleaner than the first models. The nineties opened up new perspectives for the Bombardier waterline. In 1994, the first Sea-Doo series jet boats were launched. It was a 15-foot SpeedsterTM with a crew of 4, equipped with two water cannons. The boats quickly gained popularity and the following year, Bombardier bought AMT Marine Inc., which was previously one of the main suppliers in the field of construction of water transport, and then added to its assets also Celebrity Boats, also specialized in the manufacture of boats. Since 1994, the prestigious international awards for innovation in production, design and design have fallen on Bombardier water equipment. 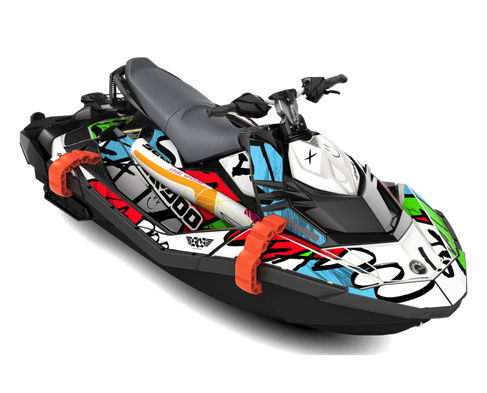 In particular, the Sea-Doo line in 1998 was awarded the Design of the Decade prize by the American Society of Industrial Designers and Business Week magazine. At the border of the centuries, the name of the awards began to sound even louder: “Hydrocycle of the Century” from Watercraft World magazine. The highest reliability of the Bombardier equipment was more than once confirmed by participation in the most difficult competitions and official supplies to the Olympic Games, and in 2002 on the Bombardier Sea-Doo XPTM jet ski Alvaro de Marichalar crossed the Atlantic Ocean - more than 10,000 nautical miles. In 2004, the aquabikes of various models of Bombardier received the “jet ski of the year” award for the sixth time, and the company itself announced reorganization and rebranding. The new name - BRP (Bombardier Recreational Products) means not only the continuation of innovative traditions, but also a new approach to quality and management, which is annually confirmed both by the emergence of new models and their success. To date, BRP produces 13 models of jet skis with engines ranging from 130 to 260 hp. and 8 models of jet boats with power from 255 to 510 hp The flagships of the Sea-Doo range are the jet ski of the 2013 model year GTX 4-TEC LTD iS 260 and the jet boat Challenger 230 SE 2012 model.